Earlier this month, junior Prameela Kottapalli’s essay, “Because She Has Hope,” was named a Best in Class entry for grades 9-12 in the 2018 Growing Up Asian in America contest. This annual contest, held by the Asian Pacific Fund, celebrates the work of Asian-American and Pacific Islander-American students in grades K-12, who submit artwork, essays and video projects addressing a theme chosen for the year. This year’s theme was My Hope for the Future. 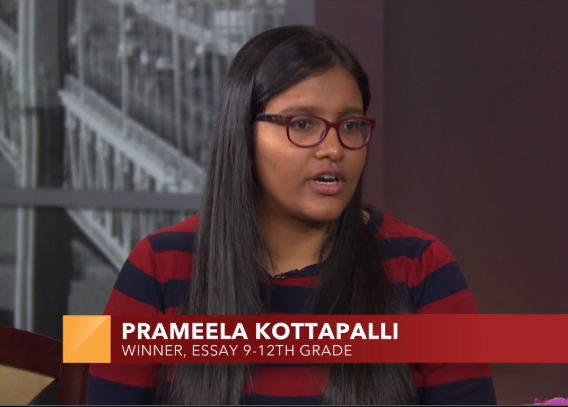 Kottapalli appeared on NBC Bay Area’s Asian Pacific America on Sunday to discuss her essay, which was inspired by the story of her mother, an immigrant who raised her as a single parent. “It’s really my mother’s hope that enabled her to overcome so much, and it’s her hope that inspires my hope for the future,” Kottapalli said during the segment.